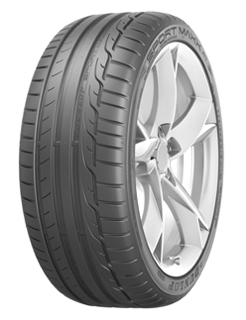 The SportMaxx RT delivers superb wet and dry grip thanks to adaptive compound technology. Motorsports derived polymers adapt to the textures of the road surface, maximising road contact and increasing grip. Enjoy stable high speed handling with smooth transitions from straight to curve. Massive outer shoulder blocks help to enhance stability and handling when cornering. Dunlop’s innovative Short Braking blocks help to ensure shorter braking distances when travelling at speed. Designed for high performance driving, these extra stiff blocks increase road contact under braking force. The SportMaxx RT employs a lightweight construction to reduce rolling resistance - lowering fuel consumption and CO2 emissions.